Well, we went up to London on a wet and blustery day (April 2nd) for the Classic Boat Awards 2019 presentation at the Royal Thames Yacht Club. True to form there was a lot more fizz than canapes to lubricate the crowd. Once the well oiled throng of a couple of hundred (mainly) suits had partaken in a rousing sea shanty we all moved upstairs to seats for the presentations. It was hot and crowded and everyone was being very polite. I found myself wedged between two of the three other shortlisted entries in our class – so the tension mounted and…. Anyway, the class winners are listed at Classic Boat Awards 2019 – Winners. We were, of course, disappointed not to win our class but mollified by the award of ‘runner up’. No-one likes being second, even to a gloriously restored Broads cruiser such as Countess of Light. On reflection, and looking at the other ‘runners up’ such as Ariki I was happy to be in such good company. I suspect that it may be some time before I am in a position to put forward another entry so it will be back to smaller projects for the present. Thinking back, the last time that I was presented with any sort of certificate is some 11 years ago, when I received my City & Guilds (Level 3) in Boatbuilding & Repairs from The Boatbuilding Academy. Quite a lot has happened since then. Fortuna II has been nominated and shortlisted for an award at the Classic Boat Awards 2019. The winner, in each award category, is decided on the basis of public votes. If you would like to see what I have done to Fortuna II during her restoration follow the link to Restoration: Fortuna II. Fred Parker Motor-Yacht. 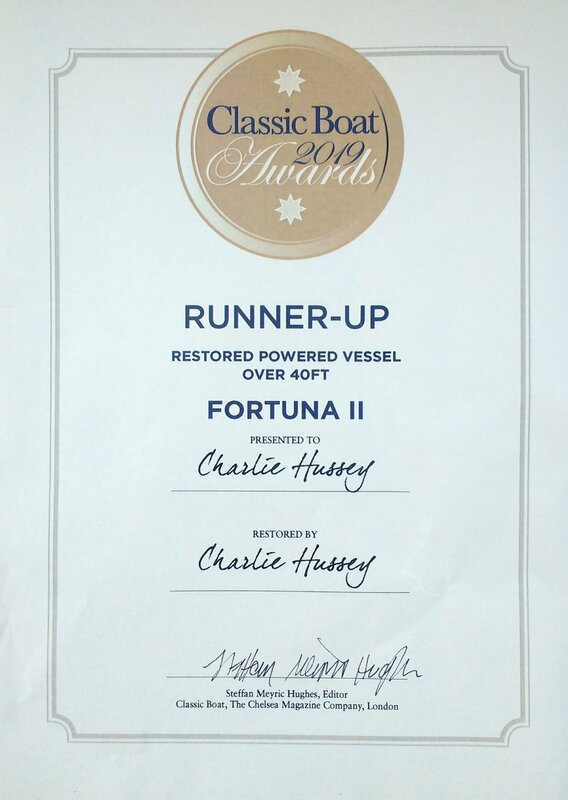 If you want to look at Fortuna II’s competition for the award follow the link to Classic Boat Awards 2019: Restored Powered Vessel over 40ft. Voting closes at 23:59 on 10 March 2019. The restoration work on Fortuna II was completed in late May 2018. Her owners, John and Catherine, with the support of son Aidan, took her off to Scotland in early June. 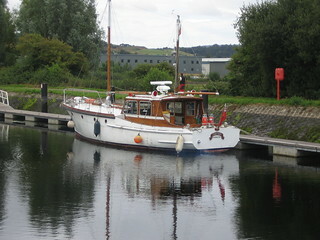 She comfortably reached Ardfern, her new summer mooring, without incident and on a single tank of fuel. I was sad to see her go but also relieved that, after such a major refit, she made the journey north so smoothly. Nigel Sharp, a regular contributor to Classic Boat Magazine, had written a feature on Fortuna II during initial sea trials in 2017 that was published in Classic Boat #364 – October 2018. The article is not available online but the teaser is available at Classic Boat #364 October 2018 Preview. The article and awards write up highlighted an interesting point regarding the differing agendas of a magazine editor, who is often looking for a unique ‘peg’ on which to hang a story and the boatbuilder, who has a much greater focus, at least in this case, on the aesthetic of the completed boat. Anyone who has looked critically at boats for any length of time knows well that the very great majority of boats look good from some angles and less good from others. Fred Parker, designing Fortuna II in the late 1950’s was operating within design constraints (volume, comfort etc) that ensured that Fortuna II would never be able to look good from every angle. So, given this fact, how should a representative photograph be chosen? In the case of Classic Boat Magazine, the ‘peg’ for the feature was clear from the title: ‘Sail to Power’. The story of how a sailing couple migrated from a sailboat to a motor cruiser – with a ‘compact’ sailing rig. The best available photograph to illustrate this was a photo of the vessel – beam on – with all sails set. I’ll leave you to judge which of the following three photographs best represents Fortuna II from an aesthetic standpoint. The photographs were all taken by Nigel Sharp who retains the copyright. After a long refit/restoration that has been consuming all my working time for nearly four years I’m pleased to say that Fortuna II has been launched and is in commission again. 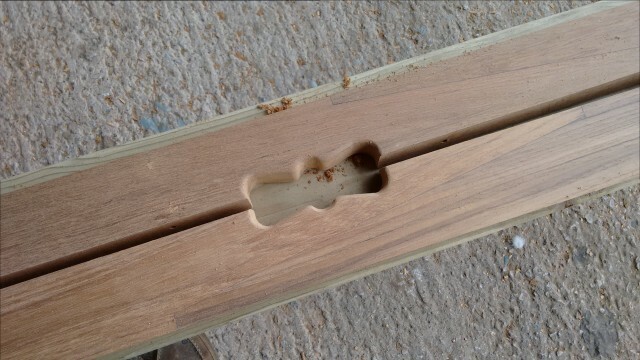 The last winter has involved a lot of fitout joinery. Fortuna II was moved out of the ‘long shed’ in early May to configure the rig. At 15 tonnes and with a beam of 14′ Fortuna II is at the limit of what the Baltic Wharf travel hoist can handle. Launch, a low key affair, took place on a rainy day. 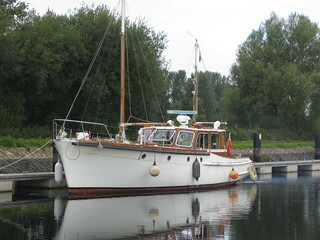 After this Fortuna II lay against the wall at Baltic Wharf to take up for a few days. 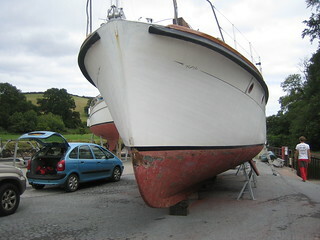 Once the deadwoods started to stabilise we connected up the prop shaft and were ready to head off down the Dart. 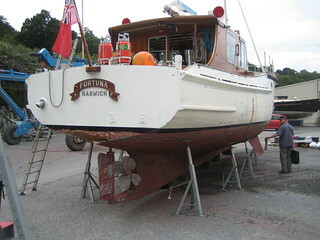 Fortuna II is based in Dartmouth for the summer where the owners are trialing her. Here she is on the Dartmouth visitor pontoons. First trials at sea gave the owner a chance to put up the sails on a nice sunny day. I was driving for a journalist so failed to take a picture of her at full speed, about 10.5 knots! Once I get a chance to take breath, which may take some time, I’ll put together a few more photos of what has been going on over the last winter or two and write up some of the more interesting aspects of the restoration. The new toe-rails for Fortuna II are being made up with scuppers to the standard ‘Fred Parker’ scupper design. A little more ornate than the original straight slots put on by Nunn Bros when they built her but, I think, reasonably in keeping. Compare it to the ‘Fred Parker’ cove-line signature. This example is one of Fred Parker’s racing yacht designs, Phizz (formerly Bluejacket) that I caught on camera in Cartaret earlier this summer. I normally get round to writing up projects when they finish. However, in the case of Fortuna II, I think that a few interim ‘position reports’ are needed. After hauling Fortuna out at Baltic Wharf in August 2013 I stripped off her paint, removed a few obviously rotten planks and undertook a detailed condition assessment. She had suffered, as is all too frequently the case, from rainwater damage. Basically sound below the waterline, but failing at the deck margins, work required included: new frame heads more or less all-round; beam shelf repairs; a rebuild of the deck step which had failed and about 450′ of above-waterline planking. Most of the electro mechanical systems (with the exception of the engine) were rejected and the tankage, wiring and plumbing systems slated for replacement. 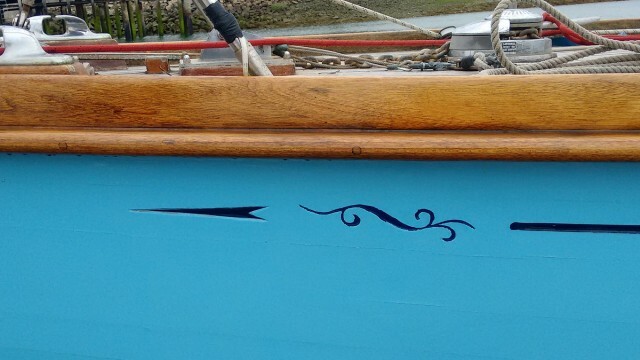 How we identified the need for a new deck is a good example of how, once you start on a restoration intending to create a boat that will be sound for a good few years, things often snowball. The deck, tongue and groove western read cedar currently sheathed in glass/epoxy was basically waterproof and in order. However, there were a large number of raised (but currently intact) blisters. The cause was the galvanised nails used to secure the deck planking. The galvanisation had (after 55 years) failed and the nails, starting to rust, had expanded and forced their way out of the top of the deck. Replacing the deck two or three years after she gets re-launched would not make sense, digging out the nails was not viable – so a new deck went on the job list.